We're a little old fashioned around here - we respond and respond quickly to customer inquiries, comments and questions. If you want to insure yourself of a fast response and one answered by the right person then click on the e-mail icon below or just copy and paste this e-mail address - edgeonup@gmail.com - into your e-mail program. Our telephone is 480 622 8859 and if you are mailing us or shipping us something small then send it to - Edge On Up - 21432 N. Central Ave. - Suite #2 - Phoenix, AZ 85024. For large part and material shipments please drop the "Suite #2" from the address. Thank you in advance for contacting us with your questions about our products. 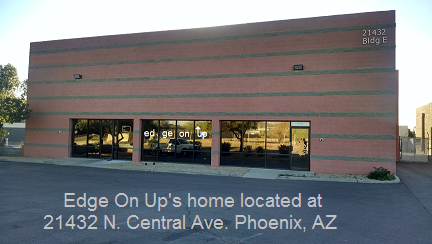 Directions - Edge On Up is located in the Deer Valley Air Park, in North Phoenix. If you're traveling on the 101 loop exit at 7th street and then travel north on 7th to Deer Valley Road. Take a left (west) on Deer Valley 1.5 miles until Central Avenue. Left (south) on Central 1 block. Turn right into our parking lot just before the intersection of Lone Cactus and Central. If you try to enter the building through the south (left) door you'll find a lot of noise and people because that's the manufacturing side. Enter Edge On Up's offices through the North door. Edge On Up was founded by Mike Brubacher in 2014 after initial development of the first edge sharpness testers were complete. Mr. Brubacher is a Kansas native and 27 year resident of Scottsdale, Arizona and has previously founded three other sensor companies in the Phoenix area including Unisonyx, Phase Laser Sytems and Beamerline. Mr. Brubacher was a long time consultant to both Lawrence Livermore Labs and Los Alamos in producing viable sensor technologies related to monitoring at the Yucca Mountain Nuclear Waste Containment Project as well as remediation efforts at the Hanford, WA disposal facility. Currently, sensors originally designed by Phase Laser monitor everything from coast line erosion in California to solar panel deployment on satellites orbiting the earth. A number of years after the sale of the sensor technologies developed by Phase Laser and Beamerline, Mr. Brubacher began work on both a sharpness testing instrument and a quantifiable sharpness scale that would work in concert with the test instrument. That edge sharpness scale is now known world-wide as the BESS. 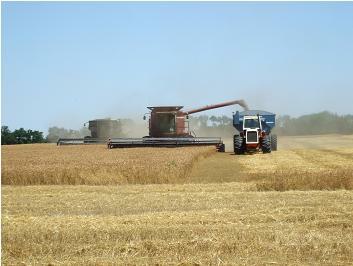 The BESS is administered by an independent registered non-profit BESS Universal (BESSU).